Now at Family Fun Hobbies…Haba Games! Family Fun Hobbies is now carrying some of Haba’s best selling Children’s Games! We are also proud to carry their new “Euro-Style” Board Games which have been taking the gaming world by storm in the last few years! We believe that play is crucial to a child’s development, but we also believe adults need to continue to play to relieve stress, be social and add fun to their lives. Haba fits this philosophy perfectly! We talked in length to the Haba representatives and play some of the games in order to make a great opening order for our customers. We made sure to cover ages 2 and up and we picked games which teach dexterity, processing, matching and more! Who can help Kiki Cuckoo build a nest for her eggs? Be careful! As soon as a few suitable twigs are on the nest you must gently rest a cuckoo egg on top; the fragile eggs may tumble down a half-built nest! It takes finesse and a little luck to be the first to place all of your wooden eggs safely in the nest. But that‘s not all; the winner will be the one who can then securely place the wooden Kiki Cuckoo bird on top of the nest of twigs! A wobbly nest-building game for 2 to 5 players ages between 4 and 99 years. Contents: 1 nesting site (= bottom part of can), 1 Kiki Cuckoo, 70 wooden sticks, 20 cuckoo eggs, 1 set of game instructions. Ages 4+! Watch is great demo video! Everyone we talked to, told us that we MUST stock Rhino Hero…so now we do! It’s a bird! It’s a plane! It’s Super Rhino! No building too high, no street too dangerous for this caped crusader, as he scales buildings and patrols the city protecting the citizens. On his quest for safety, he must use caution as even the most solid buildings may start to sway and wobble. Can you help Super Rhino accomplish the challenge to build a skyscraper as tall and solid as can be? A heroic 3D card-stacking game for 2-5 players ages 5+! Watch to learn more! In a land, far, far away lived four unicorns who were the best of friends. They enjoyed galloping across the soft, billowing clouds, sliding down rainbows and playing with cloud crystals. One day, they noticed a terrible thunderstorm approaching. They thought it would be best to head directly for the sun, and collect as many cloud crystals as possible along the way to keep them safe from the storm. Players start by choosing a colored unicorn and placing their piece on the big blue rain cloud. The player who reaches the sun cloud with the most cloud crystals is the winner. A sparkling die competition for 2-4 players ages 3-99. Following the call of the gods, your people strike out to settle at the foot of Mount Meduris. The mountain is dedicated to the most important of the Celtic gods and has fertile soil and plenty of raw material awaiting brave settlers. The fields are full of juicy grass for your sheep, and there are quarries, mines, and dense forests. The area at the foot of the mountain is divided into nine districts, whose rune stones indicate the worship of various gods. As the four chosen ones, it is your task to develop the settlements and delight the gods. Your workers obtain the materials for constructing huts and temples on the high plains of the mountain. Only a player who obtains enough materials, cleverly selects the site of their huts and temples, and gains the mercy of the gods by making offerings to the druid will be selected as leader of the tribe. -A medieval-inspired challenge for 2-4 players ages 10-99 with an approximate play duration of 75 minutes. Finally! After a long boat trip, the treasure hunters have reached the island of Karuba and can go on the hunt for hidden treasures. Who will lead their expedition team along the smartest route through the jungle trails, pay attention to the other players and keep an eye out for gold and crystals along the way? The most important thing is to start running in time! Hurry up and be the first to reach the temples to collect the most valuable treasures. But be careful! Many paths have dead ends- so you need to be patient and attentive in order to discover the best way through the jungle. The expedition team with the most valuable treasures wins the game. An addictive tile-based puzzle game for 2-4 treasure hunters ages 8-99. Game length: Approx 40 minutes. Designed and written by Rudiger Dorn and Illustrated by Claus Stephan. Karuba was nominated for a 2016 Spiel des Jahres award. …And these are just a few of what we ordered! As always, if there’s something from Haba you want, and we don’t have it in stock, we can order for you at no extra cost! Are you staying home this summer instead of travelling? Family Fun Hobbies can help! First things first, set the mood at home. Turn off your phones, maybe check social media and email just once or twice during your stay-cation. Turn on that “out of office message”, it really does work! Skip the paper, stop your mail…you might not be out of town, but you are ON VACATION! Act that way! a kite or model rocket at Family Fun Hobbies to use on your adventure! Are you feeling creative? Take a painting class, hit the art museum or try out a craft kit from the store. Shrinky Dinks anyone? Yes, they do exist and yes…we carry them! Oh no, it’s raining on your stay-cation? Don’t worry we carry puzzles, games and science kits to keep you and your family occupied! Even better, get your family talking and learning all while having fun with Word Teasers! Feeling nostalgic? How about slinky or marbles or jacks? We can help you there too! Staying home doesn’t have to be boring. Enjoy your time at home just as if you were 1,000 miles away. Act like you are on vacation. Stop by Family Fun Hobbies and ask one of our Sales Associates for even more ideas to help make your stay cation the best it can be! It’s a conversation dilemma that almost every parent has faced: How was school today? Fine. What did you do? Nothing. Getting more than a “yes,” “no,” or “fine” from a teenager at dinnertime can often be a challenge. But now there’s a solution. It’s called WordTeasers—a series of clever, table-top word games that get parents and their kids talking, laughing, and thinking—and learning something new at the same time. For example, there’s WordTeasers: Funny Sayings—an amusing word game that challenges kids, their friends, and parents to answer funny or thought-provoking questions using well-known idioms (expressions whose meaning can’t be determined by the words themselves). Questions or commands—like, “Tell about something you do once in a blue moon”; “Who among your friends loves being in the limelight”; “Tell about a time you had egg on your face”—are designed not only to help upper elementary grade students learn these idiomatic expressions, but also to help fire up great conversations among kids and their bffs, their parents, their grandparents or just about anybody else who likes to laugh out loud. The game comes with numerous suggestions for play. Number of players? “The more the merrier,” says Flora. “Simply put the colorful and compact WordTeasers box on the dinner table or kitchen counter and draw out a few cards each night. You’ll be surprised how quickly the cards generate a lively discussion on a whole variety of topics.” Other products in the WordTeasers line include WordTeasers: SAT Vocabulary (for high school students studying for the SAT or ACT), WordTeasers: Junior (conversation starters with words students should know by the end of the 6th grade), WordTeasers: World Geography (a game of fascinating and little-known facts about countries and cultures around the world), and WordTeasers: American Heroes & Legends (a deck of conversation starters based on quotes from famous Americans). Each game comes in a colorful box that is compact and easily portable for family! WordTeasers are now available at Family Fun Hobbies! We even have a few boxes open for you to try out! Family Fun Hobbies is once again heading to the New York Toy Fair! So what does that mean? Click the Pickachu to watch a quick review of TFNY 2016! #TFNY is the largest toy, game, and youth product marketplace in the Western Hemisphere! SHOW DATES: Saturday, February 18 9 a.m. – 6 p.m.
Sunday and Monday, February 19 and 20 9 a.m. – 6 p.m.
Tuesday, February 21 9 a.m. – 4 p.m. This year, Toy Fair will attract more than 30,000 registrants (including nearly 13,000 retailers, wholesalers, importers, buying groups, and trade guests) from more than 100 countries. NYC is a playground this week! At the Javits Convention Center and across the city, more than 1,100 toy companies are showcasing the products that will be under the tree this Christmas to retailers only, it’s not open to the public! As the largest toy show in the Western Hemisphere, Toy Fair is a massive celebration of play. This year’s marketplace is bigger than ever. The show is the equivalent to more than seven football fields filled with creative, innovative, and skill-building toys and games! Who comes to Toy Fair? There are more than 30,000 attendees from over 100 countries. That’s toy inventors and designers, manufacturers, toy buyers from retailers of all sizes, wholesalers, importers, entertainment executives, and more. If someone is connected to the toy industry, they are probably in town this week! Toy Fair has a dedicated area for new exhibitors called the “Launch Pad.” It is a great place to see new up-and-coming toy inventors as well as international companies looking to expand their product to the U.S. Located in Hall 1E of the Javits Center, Toy Fair first-timers represent 17 countries including Belgium, Canada, France, Germany, Hong Kong, Japan, the UK, and Poland. Toy Fair is important because play is important. Toys – which are the tools of play – promote the development of children’s cognitive, social, emotional, and fine and gross motor skills. U.S. toy and game sales rose by 5 percent in 2016, according to NPD. This speaks to the innovation and creativity of the industry. Collectibles were a top contributor to the industry’s growth. Sales jumped 33 percent and represented 9 percent of the industry’s total dollars. Additionally, games and puzzles, dolls, and outdoor sports and toys were the top three performing super-categories, each posting double-digit sales growth in 2016 compared to 2015. From board games and dolls to outdoor toys and e-connected playthings, the toy industry is churning out an incredibly diverse array of products for kids to play with! A well-rounded day of play is important for families. There is room for both traditional toys and digital playthings to help round out the play experience. o The average price of a toy is around $10. o The estimated three billion units sold across the nation each year generate approximately $26 billion in direct toy sales. o 2016 ended with a 5 percent increase in overall U.S. toy sales, according to The NPD Group. Growth categories included: games and puzzles (+18%), dolls (+10%), outdoor and sports toys (+10%), plush (+6%), infant and toddler preschool toys (+3%), youth electronics (+3%), and vehicles (+1%). o Interesting to note: Collectibles were a top contributor to the industry’s 2016 growth, with sales growing 33 percent to reach $1.8 billion. Collectibles represented 9 percent of total toy industry dollars. Among NPD super-categories, outdoor sports and toys had the largest dollar amount increase at $328 million. What does this all mean to you, our customers? It’s pretty simple really. It means that when you shop with Family Fun Hobbies, you are helping to grow this amazing industry of toys and games. You are helping a small, local business and you are part of a growing trend! To get you involved Katrina and Rob will be posting pictures, updates, videos, surveys….whatever they have time for, to our Facebook and Twitter accounts! We NEED your input so that we are focusing the store in the direction you want it go. As a reward for your help, we will give away all of the #TFNY SWAG we get via random drawing. You just have to interact with us to be entered! As another reward, we are making room on our shelves for all of the new products. Keep an eye out for in-store sales. Right now all 4M Science and Craft Kits are Buy 2, Get 1 FREE!!! Watch our Facebook LIVE video for more information! Have you started to think of your upcoming Science Fair Experiment? We can help you ideas and parts. All 4M science kits are on sale buy 2 get 1 free through March 4, 2017 to help with that! Today, however we are talking about inspiration. Do you needs some? 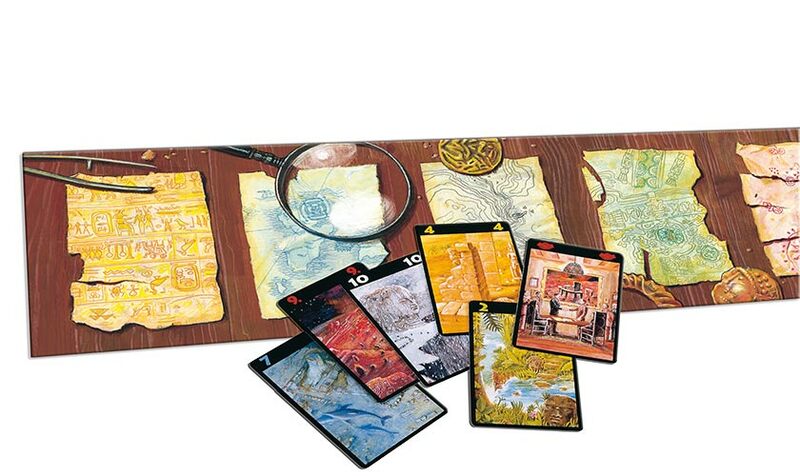 How about trying the Board Game Legendary Inventors by Asomdee? Click the game to watch a quick demo! Over the course of human history, curious and cunning men and women have explored the limits of science, technology, philosophy, and more. Exciting discoveries and brilliant new inventions have the capability to alter the landscape of humanity into the far reaches of the future. These intellectual pioneers have organized across time into teams of sorts, combining their talents in an effort to more effectively create new inventions. Which of these teams will be known throughout history as Legendary Inventors? Calling all mathematicians, chemists, mechanics, and physicists! Innovative experts are needed to push the boundaries of human discovery and create useful inventions to carry us into the future. 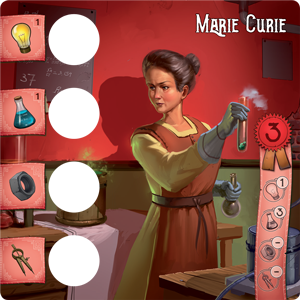 Now you and your friends can lead a team of some of history’s greatest minds to glory as you create historically significant inventions to advance humanity. 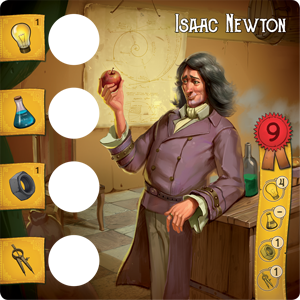 In Legendary Inventors, a game for two to five players, you are in charge of a team of four inventors of great renown. Direct your team to complete magnificent new inventions to gain rewards and notoriety, and help your inventors achieve even greater inventive feats by pushing them to gain more knowledge and broaden their skills. Rival teams must collaborate to complete new inventions, but will compete to patent or acquire as many completed inventions as possible to earn victory points. As more and more inventions are completed, these discoveries build on each other and enable increasingly more complex and advanced inventions to be thought up and constructed. This is symbolized by Ages, the three phases of a game of Legendary Inventors. The player leading the team with the most victory points at the end of the third Age is the winner, and will go down in history as Legendary Inventors. You and your team of inventors will shape history as you complete progressively more complex inventions. 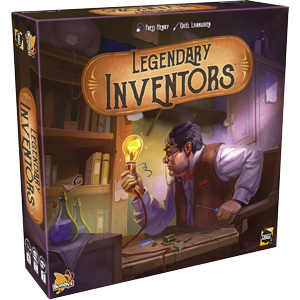 Legendary Inventors is easy to learn and quick to set up, so you and your friends will be scrambling to patent your newfangled creations in no time. Legendary Inventors will provide experiment, inventor and idea inspirations to the young and old. Available at Family Fun Hobbies now! Ages 10+. 2-5 Players. 40 Minutes Play Time. Have you played it yet? Let us know! Math Fluxx is coming March 9th! Are you fan of Fluxx? Do you know Fluxx? Either way, this post is for you! All Looney Labs Games, the inventor of all of the Fluxx Card Games are chock full of fun, but did you know they are actually educational, too? Fluxx games encourage critical thinking, text analysis, and reading comprehension, and the foreign language versions are excellent to help learn another language or with ELL students. Chrononauts and Early American Chrononauts cover key events in US History and encourage deep cause-and-effect thinking. Mad Libs®: The Game enhances language studies, emphasizing parts of speech and vocabulary building. And don’t even get us started on all the education things you can do with Pyramid Arcade! This means Looney Labs’ games are just perfect for integrating into classrooms – not just for play, but to help teach and support curriculum. 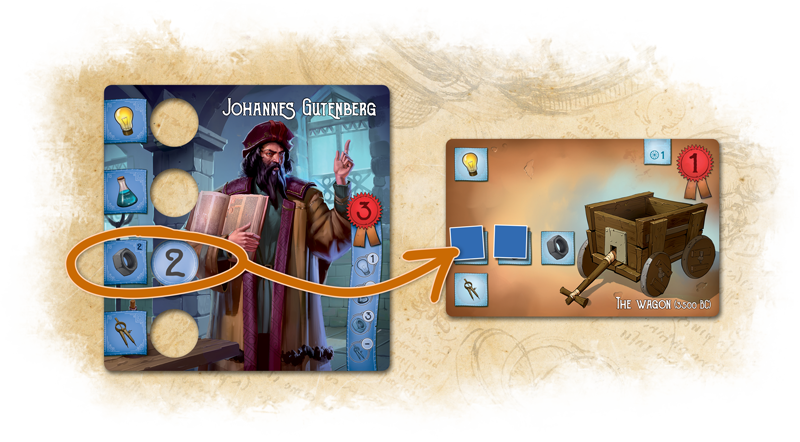 From history to geometry to language studies to creative writing, our games have everything to make learning fun! Adding to their Learning Theme, Looney Labs is about to release Math Fluxx: The Numerical Card Game With Ever-Changing Rules! Pre-Order at Family Fun Hobbies Now! 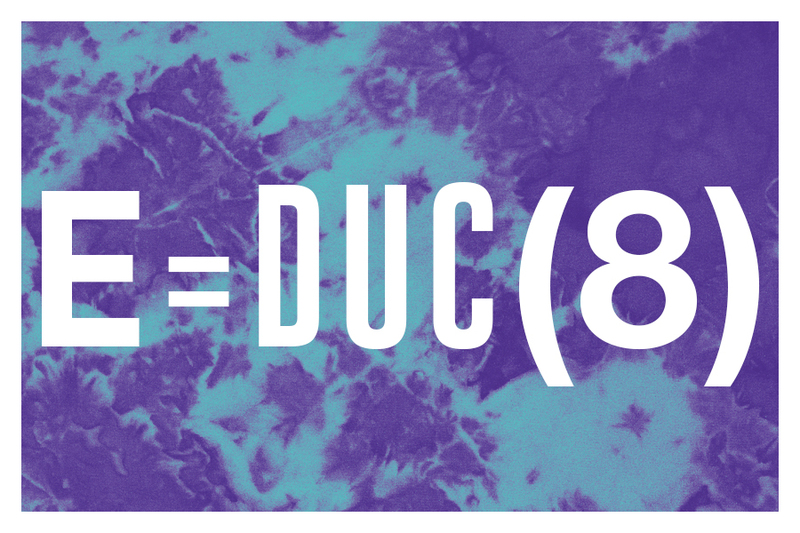 Math Fluxx is really all about the numbers. Players use positive integers (whole numbers) in their quest to achieve a very mathematical Goal. But it’s not just putting 4 and 2 together to achieve the 42 Goal (for example); Math Fluxx also features the Plan B Meta Rule. Plan B puts Special Victory Rules into play which give you a second way to win and require even more arithmetical acumen (ex. Plus Victory lets you win if your Keepers add up to the current Goal). With Math Fluxx, the fun is exponential! 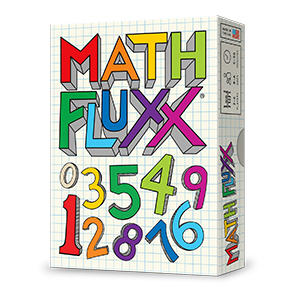 Math Fluxx will be available on March 9, and is the most numerical version of Fluxx ever. The Keepers are all numbers and the Goals are all number-based. Add to that some mega-math Meta Rules and you’ll actually have to do addition, multiplication, or a combination of elementary operations to match the Goal. With Math Fluxx, the fun is exponential! It all begins with one basic rule, just like every other Fluxx theme: Draw one card, Play one card. You start with a hand of three cards… add the card you drew to your hand, and then choose one card to play, following the directions written on your chosen card. As cards are drawn and played from the deck, the rules of the game change from how many cards are drawn, played or even how many cards you can hold at the end of your turn. Winning is based on the Goal Card, but the Goal Card changes too, thus the game is always in “Fluxx”. Watch Andrew and Kristen Looney play the first game of Math Fluxx below! Watch the Math Fluxx Demo Here! Board & Card Games for Valentine’s Day! Let’s face it, sometimes you just want to play a game with your significant other, or you just don’t have 4 people available for a larger player game. To celebrate Valentine’s Day, here are some games you can play with just 2 players! 1. 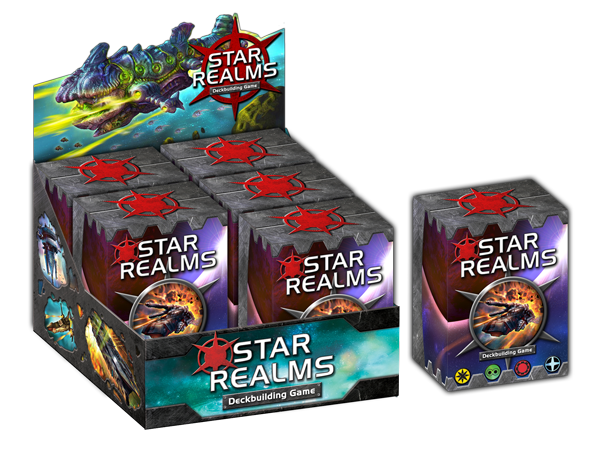 Star Realms – Star Realms is a basic two-player deck building game set in a distant future where d ifferent races battle over resources. To win, you need to build up your fleet of bases and starships until you have enough power to wipe out your opponent. Similar to other deck building games, you want to try to obtain cards that work well together; and in Star Realms, that means getting cards that are from the same faction. Cards can be purchased using “trade” points and players attack each others “authority” points using “combat” points. The first player to reduce their opponent authority points to zero is declared the winner and supreme ruler of space. 2. Patchwork – A light, two-player game about quilting from the designer best known for the heavy serf farming epic Agricola, the heavy Frisian farming epic Fields of Arle, and the heavy dwarf farming epic Caverna? Yep…and we love it! 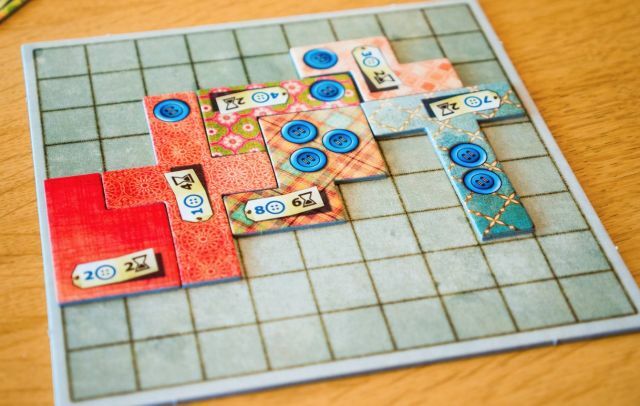 Patchwork is a two-player game about picking up fabric pieces and assembling them, Tetris-like, onto your per sonal square game board while simultaneously trying to maximize the number of “buttons” that these pieces deposit in your personal treasury. The game uses a wonderful circular movement mechanic to ensure that on each turn, players have a choice of just three fabric pieces—but that these three change constantly. smooth and engaging. Quilt away! 3. 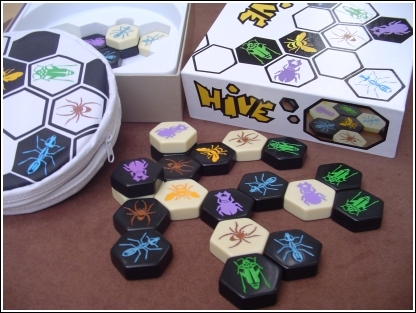 Hive – Hive is “like chess but with bugs—and no board.” Depending on your entomological proclivities, that may sound amazing or like an idea worthy of being squashed. But if you’re in the former camp, give Hive a chance; it’s a winning two-player-only game that’s compact enough to be played at a cafe and short enough to break out when you have just a few minutes of downtime. In Hive, each side, white and black, must protect its queen bee while simultaneously moving to encircle the opposing queen. The “board” is simply any flat surface; pieces are placed in alternating turns, with each hex-shaped slabs growing the “hive” in organic fashion. Different pieces show different insects, and each kind of bug moves differently—worker ants can move at will around the edges of the hive, while beetles can clamber up and over other pieces—so the hive morphs constantly. Play itself has only a few simple rules about unit placement and movement, which are easily mastered even by many children. 4. Lost Cities – Who will discover the ancient civilizations? Two explorers embark on research journeys to remote corners of the world: the Himalayan mountains, the Central American rainforest, the Egyptian desert, a mysterious volcano, and the bottom of the sea. As the cards are played, the expedition routes take shape and the explorers e arn points. The most daring adventurers make bets on the success of their expeditions. The explorer with the highest score after three rounds of expeditions wins. The rules of the game are simple, but beware: The lost cities hold many unseen mysteries! Watch this quick overview video now! 5. Carcassonne – In Carcassonne, players build the area surrounding this impressive city, one tile at a time. They then place a follower on fields, cities, roads or monasteries in order to score as many points as possible. These followers will become knights, monks, farmers and thieves, depending on where they are placed. No matter their function, the player who will most cleverly use their followers will win the game. 6. Splendor – It is the renaissance. Fine art is in demand and wealthy nobles are looking to spend their family’s coin. You, a rich merchant, are only too happy to take advantage of these fine folks. You will use your resources to acquire mi nes, transportation methods and artisans who can turn these raw gems into profitable jewels. Splendor is, at its heart, an engine building game. The main focus of the game will be acquiring development cards by spending your gems (chips). Every card you buy makes it easier to acquire future cards and may also provide you with prestige points (victory points). The key is that these purchased cards allow players to buy subsequent development cards for a lesser cost. Be the first player to 15 prestige points to win. 7. Lanterns: The Harvest Festival – The harvest is in, the workers are fed, and now it’s time to cele brate! Players act as artisans decorating the palace lake with floating lanterns in preparation for the annual harvest festival. On a turn, a player places a tile depicting various color arrangements, and every player receives lantern cards based on the tile placed. Players dedicate sets of lantern cards to gain honor and favor. We love how visually beautiful this game is. While simple in rules, this game is full of strategy! 8. Castellan – Two players work together to build a castle. Wall and tower pieces link to form courtyards. The player who finishes a courtyard claims it with a Keep. Click to watch a quick video! Your cards de termine what pieces you get each turn . . . but you decide where to put them. If you’re clever, the pieces played by your opponent can end up scoring for you! 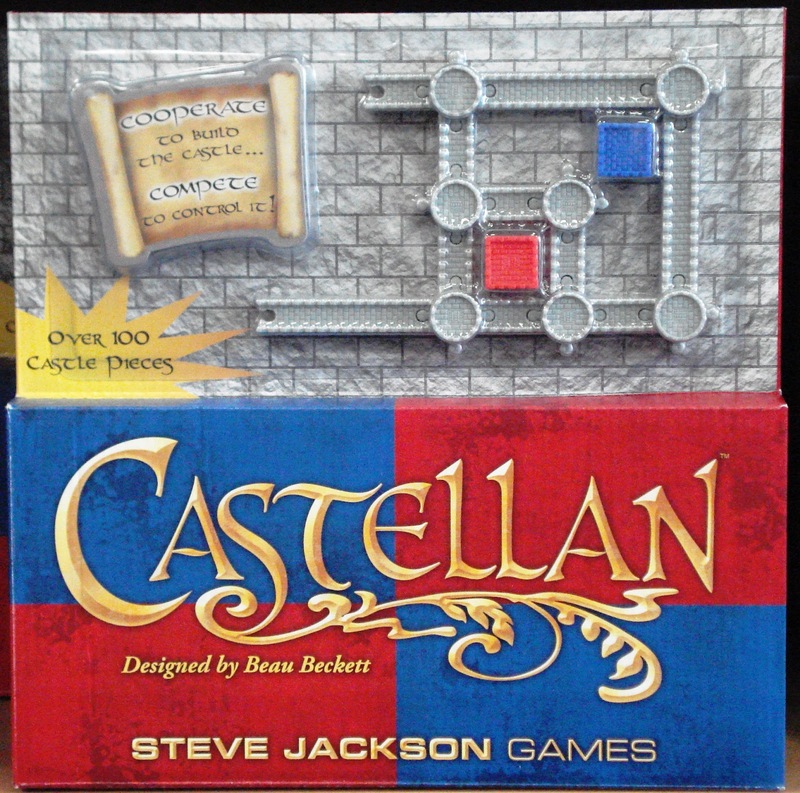 Castellan includes 108 detailed castle pieces and 28 cards, and plays in less than an hour. If you combine red/blue and green/yellow Castellan sets, you can play with three or four players. The main exhibit cards could earn you the most points, but only if you have the supporters you need in the matching area to get the exhibits approved into the fair. Favors from the influential figure cards will increase your supporters in the areas and help you approve the exhibits you’ve already collected. The Midway ticket cards for the fun and profitable attractions score you a small number of points and move the game forward. 10. Love Letter – Love Letter is a game of risk, deduction, and luck, for 2–4 players. Designed by Seiji Kanai, the game features incredibly simple rules that create dynamic and exciting player interactions. Players attempt to deliver their love letter into the Princess’s hands while keeping other players’ letters away. Powerful cards lead to early gains, but make you a target. Rely on weaker cards for too long and your letter may be tossed in the fire! There are currently nine releases in the Love Letter series! Did we miss a great 2 Player Game? Please let us know on our Facebook Page!